Need to do a word count from a Word, Excel, HTML, XML or PDF file? I had to send on a word count to a customer recently. Nothing new there. Client's ask for word counts all the time, especially if they are getting content translated. Usually I copy the text into Word document and do a word count from there but this was proving too time consuming. 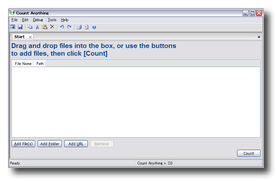 A quick search online and I stumbled onto a small program called 'Count Anything'. It's a free program for Windows users that allows you to drag any supported file onto it and it lets you know the number of words and characters in the document. Very handy! I love finding programs like this. If you know of any other neat little programs you use day to day let me know.